Seminal Hong Kong action movie that established its creator Tsui Hark (pronounced Choy Huck) as one of the foremost directors of his generation and heralded Hong Kong cinemas introduction into the world of special effects. This movie sparked numerous clones, not least Shaw Brothers ‘Holy Flame of the Martial World’ and more recently a (slightly disappointing) sequel in Legend of Zu. While Tsui Hark found greater critical acclaim with later movies such as Once Upon a Time in China, its the sheer number of fantastic visual shots, unrelenting action and incredible ideas present in the film which make this my favourite from that director. As with Legend of Zu, its the inventiveness of the design is the movies most endearing quality, but in this case the acting and the story are both suitably engaging. The performances are superb, with a great mix of humour and drama. Yuen Biao is excellent (as ever) and his scenes with Sammo Hung (here playing two parts) are particularly entertaining. The action contrasts physical swordplay with animating magical weapon attacks and special abilities to great effect. It also brilliantly introduces supernatural elements gradually so as not to overwhelm the viewer and although it outlines a clear gulf between mortal and immortal it also shows us that the gulf can be bridged. 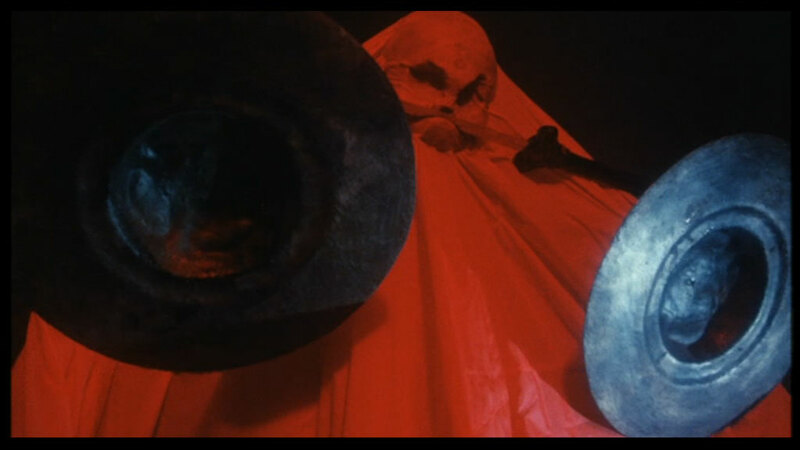 The Blood Monster, while visually interesting doesn't really have any personality at all, literally. It never speaks, and for most of the movie doesn't really do anything. So it doesn't make for the most memorable of movie screen villains. 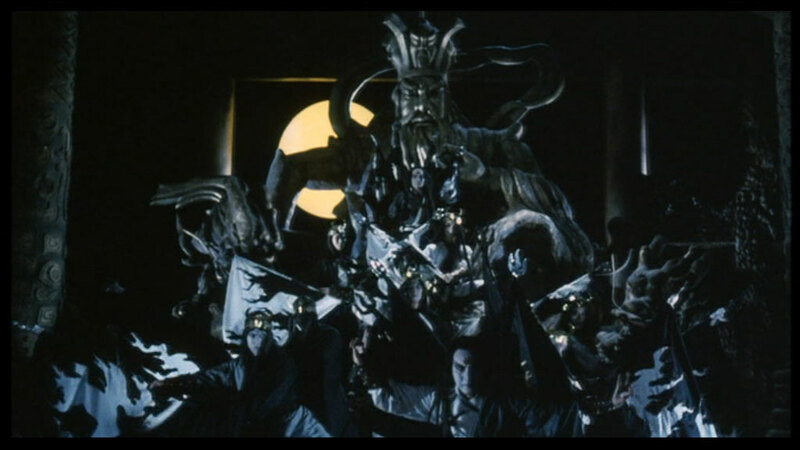 The movie also peaks early on with the fantastic assault on the Temple of the Blood Monster, and although the rest of the movie is still good, it doesn't really build to a satisfying climax. After the attack on the Temple of the Blood Monster, we never see nor hear from the evil Disciples or evil High Priest again. There is no explanation given for their absence, are we just assumed to think they wouldn't take a hand in defending their patron? Also why does Lady Li-L-Chi never become an active participant in the proceedings? 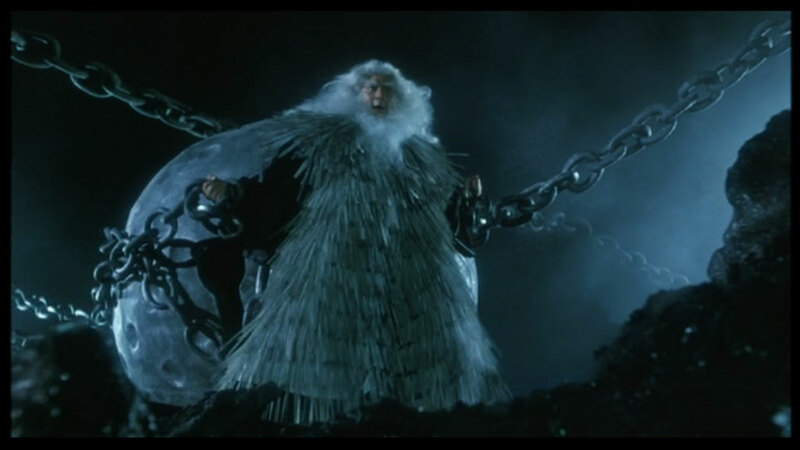 So there are a few unanswered questions which gnaw at the movies continuity. The opening minutes introduce you to what is ostensibly the mortal world where war is rife and show Ti Ming Chi to be a capable fighter. The scenes with Yuen Biao and Sammo Hung are (of course) fantastic, with both their skill and humour allowed to shine. 2. Forgotten Tomb: Ti Ming Chi finds himself in the mystical regions of the land and decides to seek shelter in a foreboding building only to find himself under attack by evil wraith like spirits, Ti Ming is saved (in the movies first deus ex machina moment) by Ting Yin (Adam Cheng), who is an immortal (epic) fighter. Ti Ming Chi, impressed by Ting Yin’s prowess asks to become his pupil. Knowing his mission is to storm the temple of the blood god, Ting Yin is reluctant to take a pupil, but Ti Ming Chi is dogmatic. 3. The Temple of the Blood God: At the temple they meet up with another epic/immortal warrior monk, Abbot Hsiao Yu (Damian Chan) and his student Yi Chen (Mang Hoi). The two immortals are wary of each other, being as they are from different sects, even though their mission is the same. The assault on the temple of the blood god is another of the movies fantastic set pieces with the monks battling the evil high priest and his disciples, while the students just try to stay out of harms way. 4. Battle with the Blood Monster: After the failed attack on the temple the two immortals and their young students retreat to review the situation, each blaming the other for the failure. They can’t agree to work together so decide to go their separate ways. This doesn’t last long as they both find themselves immediately confronting the manifestation of the blood god who overpowers them, wounding Abbot Hsiao Yu. 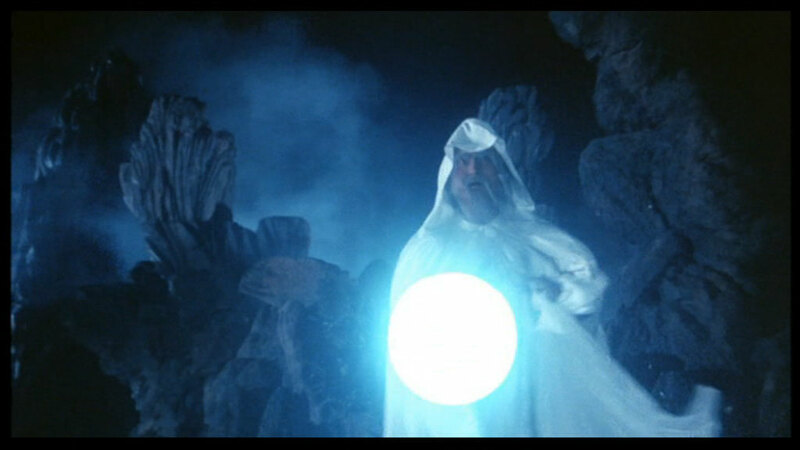 This leads us to the movies second deus ex machina in the form of Long Brows (Sammo Hung), who shows up just in time to destroy the blood monsters physical manifestation, unfortunately even Long Brows cannot fully destroy its evil soul but he can hold it at bay until it the power of his Sky Mirror artifact wanes in 49 days time. Long Brows informs them that the sword of heaven and the sword of the earth, mighty weapons belonging to Lady Li-L-Chi (Judy Ong) are needed to defeat the blood monster, and even they might not be enough. 5. Fortress: The heroes first have to heal the devil possessed Abbot Hsiao Yu. 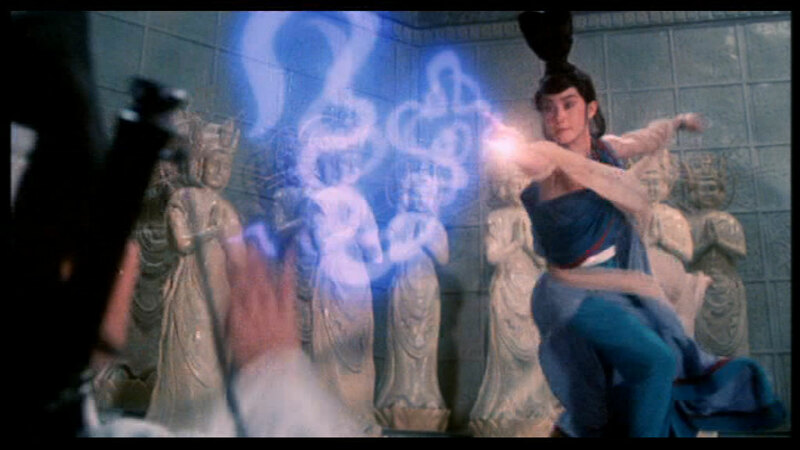 On the way there they are attacked by a shape-shifting witch, whom Ting Yin swiftly decapitates. They arrive at the monastery of the Countess but the guards (all female) say the she won’t see them unless they were sent by fate as dictated by the ebbing blue flame in the courtyard. However, before a scuffle occurs the Countess makes an appearance and through an elaborate ceremony manages to heal the Abbot. The Countess faints and Ting Yin catches her, only to be slapped for his trouble (a sure sign romance is on the cards) and the two (playfully) fight each other. Ti Ming Chi gets knocked out as the fight erupts to encompass all the guards. Ting Yin decides to realign Ti Ming Chi’s arteries; a process we are told will make him a super fighter (or at least seemingly raise him to the level of the other immortals). The two then leave to resume their mission, with the still weakened Abbot and his student remaining behind. Ting Yin decides Ti Ming Chi needs a weapon and gives him one of his swords. Unfortunately he gives him the black sword which decapitated the shape-shifting witch earlier in the movie, as its drawn some of the blood splatters Ting Yin and he gets possessed himself. So its back to the Countess to get him healed. Unfortunately she’s too weak after her last effort to heal him and as he turns to evil, everybody fails to restrain Evil Ting Yin and the Countess decides she must encase the entire Fortress in ice to stop him. 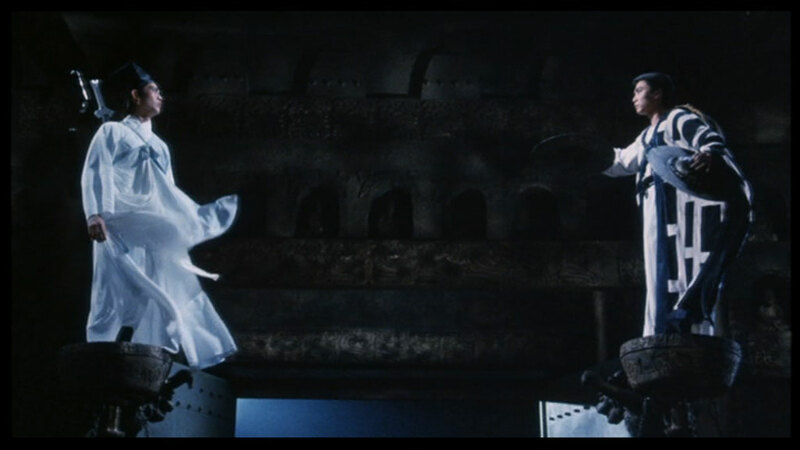 Unfortunately, Evil Ting Yin is able to escape, but fortunately so are the two students and the female guard Captain. 6. Heavens Blade: The heroic trio continue their quest for the two swords, finding themselves at the border between heaven and hell, defended by Heavens Blade (Norman Chu), a rather eccentric immortal chained to a giant iron ball. He tells them that Lady Li-L-Chi’s mountain is ‘just over there’. But before they can do anything Evil Ting Yin shows up, now bedecked all in red. For some undisclosed reason he wants to enter Hell (possibly to gain his own two swords to counter those of Li-L-Chi's?). The heroes and Heavens Blade try to stop him but fail, with Heavens Blade having to sacrifice himself to save the heroes from Hells embrace. 7. 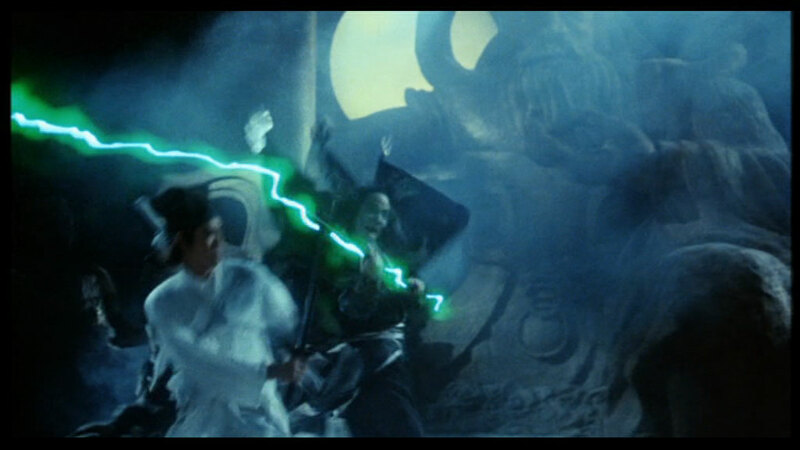 Combining the Swords: The heroes meet up with Lady Li-L-Chi and gain her magical swords (purple and green lightsabres respectively), but the Blood Monster is now so powerful that the swords must be united to defeat it. Evil Ting Yin shows up to stop that happening, brandishing his own pair of (red) lightsabres. No matter what they do the heroes can’t defeat Evil Ting Yin, who just has to hold them off and allow the Blood Monster to awake now that the 49 days are up and Long Brows Sky Mirror has just failed. 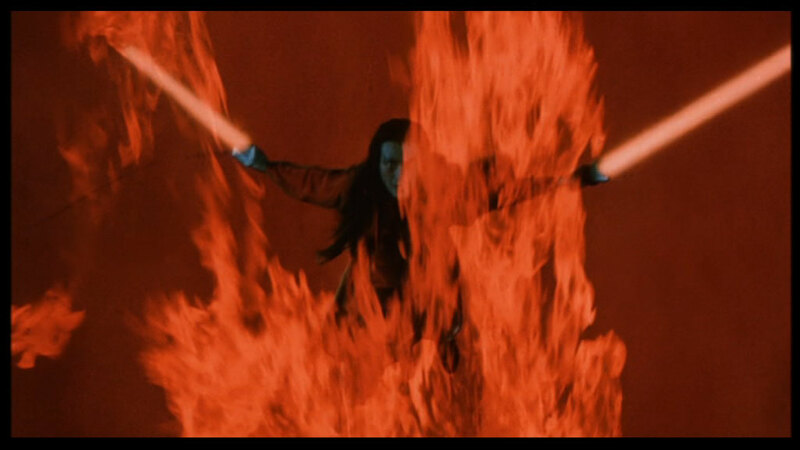 However in the final moments the Countess shows up (for the third deus ex machina moment) and sacrifices herself to kill Evil Ting Yin allowing the heroes to combine the swords of heaven and earth and smite the Blood Monster seemingly obliterating it. Determining some of the characters classes was quite tricky. The Blood Monster (Lesser Deity; ArchDevil) – Lawful Evil, 49 HD, possibly an aspect of Asmodeus? Sword of Heaven: +6 brilliant energy, defending, holy longsword. Market Value 3,380,000 GP. When combined, the swords become a +12 brilliant energy, chaotic power, defending, holy power longsword. Market Value 21,780,000 GP. White sword: +5 dancing, defender longsword. Market Value 200,000 GP. Black sword: +1 dancing, vorpal longsword. Market Value 200,000 GP. Great Standard of Evil: +1 dancing, shocking burst, unholy shortspear, with standards attached delivering symbols of death and pain on a critical hit. Standard of Evil: +1 flaming burst shortspear, with standard attached delivering a symbol of death upon a critical hit.